An analysis of recent and historical U.S. Geological Survey streamgage information was used to assess geomorphic changes caused by the 2011 flood, in comparison to selected historical floods, at three streamgage sites along the lower Missouri River—Sioux City, Iowa; Omaha, Nebraska; and Kansas City, Missouri. Channel-width change was not evident at the three streamgage sites following the 2011 flood and likely was inhibited by bank stabilization. Pronounced changes in channel-bed elevation were indicated. At Sioux City and Omaha, the geomorphic effects of the 2011 flood were similar in terms of the magnitude of channelbed scour and recovery. At both sites, the 2011 flood caused pronounced scour (about 3 feet) of the channel bed; however, at Omaha, most of the channel-bed scour occurred after the flood had receded. More than 1 year after the flood, the channel bed had only partially recovered (about 1 foot) at both sites. Pronounced scour (about 3 feet at Sioux City and about 1.5 feet at Omaha) also was caused by the 1952 flood, which had a substantially larger peak discharge but was much shorter in duration at both sites. Again, at Omaha, most of the channel- bed scour occurred after the flood had receded. At Sioux City, substantial recovery of the channel bed (about 2.5 feet) was documented 1 year after the 1952 flood. Recovery to the pre-flood elevation was complete by April 1954. The greater recovery following the 1952 flood, compared to the 2011 flood, likely was related to a more abundant sediment supply because the flood predated the completion of most of the main-stem dam, channelization, and bank stabilization projects. At Omaha, following the 1952 flood, the channel bed never fully recovered to its pre-flood elevation. The geomorphic effect of the 2011 flood at Kansas City was fill (about 1 foot) on the channel bed followed by relative stability. The 1952 flood, which had a substantially larger peak discharge but was much shorter in duration, caused modest fill (about 0.5 foot) on the channel bed. The 1993 flood, which also had a substantially larger peak discharge but was much shorter in duration, caused pronounced scour of the channel bed (possibly as much as 4 feet). Similar to the floods at Omaha, much of the channel-bed scour at Kansas City occurred after the 1993 flood had receded. More than 1 year after the 1993 flood, following partial recovery (about 1 foot), the channel bed had stabilized, at least temporarily. Following the 1993 flood, the channel bed never fully recovered to its pre-flood elevation. For each flood in the post-dam era that resulted in substantial channel-bed scour (Sioux City in 2011, Omaha in 2011, Kansas City in 1993), recovery of the channel bed to its pre-flood elevation had not occurred more than 1 year after the flood (20 years after the 1993 flood at Kansas City). Thus, the possibility exists that channel-bed scour caused by large floods may have a cumulative effect along the lower Missouri River. The persistence of the flood-related decreases in channel-bed elevation may be indicative of the constrained ability of the channel to recover given a limited sediment supply caused by one or more of the following factors: upstream storage of sediment in reservoirs, bank stabilization, commercial sand dredging, depletion of readily available sediment by the flood, and a lack of post-flood sediment contributions from tributaries. 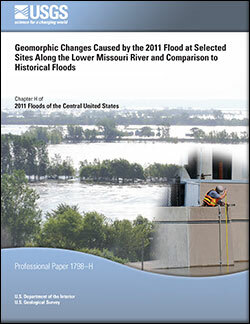 Juracek, K.E., 2014, Geomorphic changes caused by the 2011 flood at selected sites along the lower Missouri River and comparison to historical floods: U.S. Geological Survey Professional Paper 1798–H, 15 p., https://dx.doi.org/10.3133/pp1798H.